Find out what guns all the cool Guardians are using in the Trials of the Nine. No matter how hard developers try to balance things, some items inevitably rise above the rest to become the meta in certain activities. In Trials of Osiris in the original Destiny, Sniper Rifles became the meta. In the Trials of the Nine for Destiny 2, a couple weapons have emerged as the “best” thus far, although by best we just mean that everyone is using them. Safe to assume they’re not the worst, though. 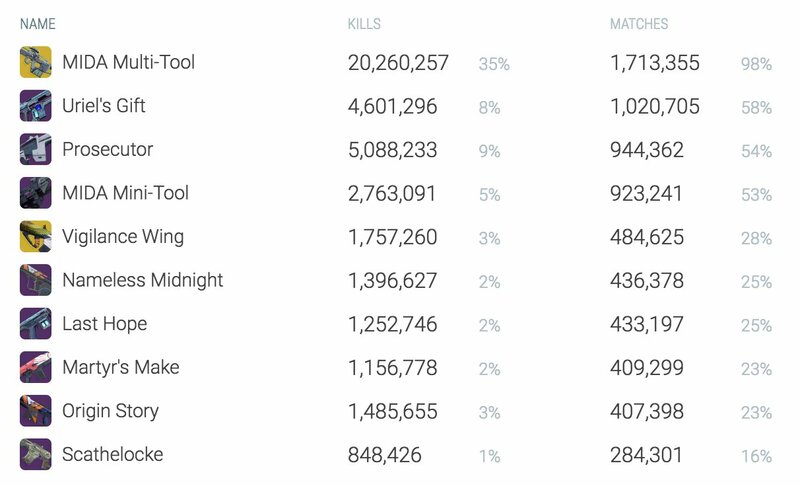 According to the Destiny Trials Report Twitter account, the two most popular weapons in Trials of the Nine for Week 1 were the MIDA Multi-Tool Exotic Scout Rifle (Kinetic) and the Uriel’s Gift Legendary Auto Rifle (Energy). The MIDA Multi-Tool racked up over 20 million kills, which accounts for about 35 percent of all kills in the Trials of the Nine last week. It was also used by at least one Guardian in 98 percent of Trials of the Nine matches, which is astonishing. Other weapons used in more than 50 percent of the Trials of the Nine matches were Prosecutor Legendary Auto Rifle (Energy), and the MIDA Mini-Tool Legendary Submachine Gun (Energy). These are all options worth considering when you and your fireteam step into Trials of the Nine this week. If you’re wondering how you can get your hands on these weapons, Shacknews has a guide for how to unlock the MIDA Multi-Tool and MIDA Mini-Tool. The other weapons are a bit more complicated, though, as they are generally obtained through decrypting Legendary Engrams. The two you want to focus your attention on are the Prosecutor and Uriel’s Gift, as they are objectively the two best Auto Rifles in the game right now. Head into Trials of the Nine with a MIDA Multi-Tool as your Kinetic, and either the Prosecutor or Uriel’s Gift Auto Rifles as your Energy weapon. The guns are almost identical, so swap them in and out as you see fit. For more help on your PvP and PvE journey, be sure to visit the Shacknews Destiny 2 complete strategy guide, where we help you obtain Exotic gear, work your way through the Raid, and even cheese the Nightfall.